Use the links below to download our forms and brochures quickly and easily. Download our current program application. The Annual Compliance form for property owners is available on the Owner's tab in the right-hand column. If you have not received one of these in the last 12 months, please fill out this form and return it to the address provided. 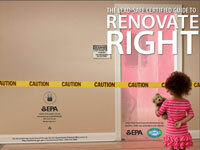 Renovate Right - The industry standard which defines lead hazards and lead safety and all the basic information regarding the EPA RRP rule and how to perform a renovation correctly and 'lead-safe'. Protect your Family From Lead in Your Home - Another industry standard containing everything you need to know about lead, lead safety and how to protect your family from this hazard in the home. Reducing Lead Hazards When Remodeling Your Home - Another excellent source for A-Z information about lead safety when renovating your home. 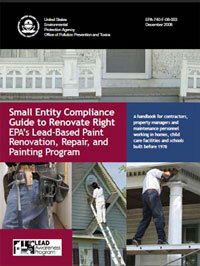 Small Entity Compliance Guide - The RRP rule in a nutshell. A-Z for contractors. 7 Steps for a Healthy Home - 7 quick & easy steps to help keep your home safe and healthy. Help Yourself to a Healthy Home - An A-Z 'healthy home' brochure covering everything from allergens to air and water. Lead and Pregnancy 2010 - A 300 page comprehensive booklet covering everything both pregnant and new mothers need to know about protecting their unborn and newly born babies from lead poisoning. NH Blood Level Surveillance Data 2008 - The bottom-line finding and statistics from the 2008 childhood blood-lead level study. 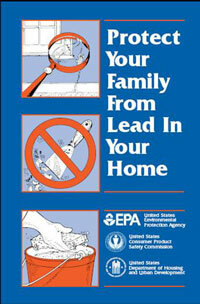 EPA's Lead Brochure - EPA's 'quick-learn' 2 page brochure about lead and where to find help and additional information. Effects of Lead on Children - A 1-sheet handout on the symptoms and effects of childhood lead poisoning. Lead Poisoning and Learning - A 1-sheet handout on how lead poisoning effects childhood learning. Lead Poisoning, Behavior & Violence - A 1-sheet handout on the links between lead poisoning, behavior difficulties and violence. Lead Poisoning Prevention Saves Community Huge Money - A 2-sheet handout on how lead poisoning prevention creates huge bottom-line savings for society. Eliminating Childhood Lead Poisoning - The complete 91 page booklet from the U.S. government explaining their plan to eliminate childhood lead poisoning. What Every Caregiver Should Know About Lead - An educational 1-sheet checklist for caregivers regarding lead safety. Greater Manchester, NH Health Improvement Plan - The City of Manchester Health Department and the Greater Manchester Public Health Network are pleased to present the first Health Improvement Plan for the Greater Manchester Public Health Region.